Libraries collect the vast stores of human knowledge and imagination. A library is a collection of sources of information and similar resources, made accessible to a defined community for reference or borrowing. It provides physical or digital access to material, and may be a physical building or room, or a virtual space, or both. A library’s collection can include books, periodicals, newspapers, manuscripts, films, maps, prints,documents, microform, CDs, cassettes, videotapes, DVDs, Blu-ray Discs, e-books, audiobooks, databases, and other formats. The library complex is an edifice with three floors, reputed to be one of the largest in Africa. The total floor area of the complex is 11,300m/2. It is designed as an imposing glass structure, which portrays learning as the major activity in the University. The Mission of the ‘Nimbe Adedipe University Library is to provide a user centered information environment that supports inspirational teaching, exemplary research, meaningful service, and life long learning to the local and global university community. In support of this mission, the University Library integrates print and electronic resources, and provides a comprehensive program of service which allows broad access to information in all formats. The Library was named ‘Nimbe Adedipe Library to honour the first Vice-Chancellor of the University, Professor Nurudeen Olorunnimbe Adedipe. The ultra modern library building can accommodate 1000 users at a time. The total collection of books at present is 75,622 titles. In the first seven years of it’s existence, the library was housed in temporary and cramped quarters, which were ill-equipped for the requirements of a University library. In October 1989, it moved to its permanent building, the four floors of which covered a total‘ area of 42,000 sq. ft., designed to accommodate 250,000 volumes and sit 800 readers. So far, the Library has over 400,000 catalogue records needing conversion.About 15,000 bibliographic records of newly acquired books inputted into the old database, would be transferred to the new. The bulk of the Library’s catalogue remains in card format. On October 25, 1976 after the Principal’s maiden address to the foundation students and staff in the Africa Hall at about 10.00 a.m. the University Library formally commenced its routines and services to clientele. The Library provides a wide range of services. Arrangements have been completed to resuscitate inter-library loans and bindery services. Hardware facilities are available for consulting audio-visual and e-resources. Detailed instruction in Library use is provided to undergraduates as part of the General Studies programme while advanced bibliographic courses are to be worked out for final year and postgraduate students and staff preparing for their long essays dissertations and research respectively. All enquiries regarding reader instruction, either on individual basis or in groups should be made to the Readers’ Services Librarian. At the University’s inception, the Owelle of Onitsha, Dr. Nnamdi Azikiwe donated 12,000 volumes of books. 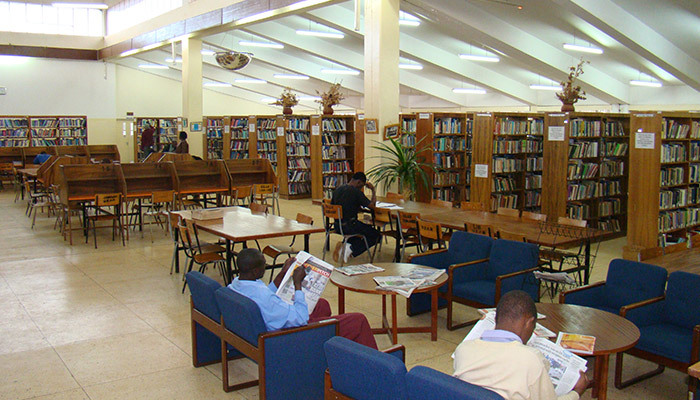 In 1962/63 the University library holdings had increased to 27,000 volumes with a seating capacity of 220 readers. Presently, the University Library System has about 735,157 volumes of books and about 99,760 bound volumes of journals. Babcock University (BU) has its roots in the Adventist College of West Africa (ACWA), established on September 17, 1959 with an initial intake of seven ministerial students. The University is fully owned and operated by the Seventh-day Adventist (SDA) Church, and registered under the laws of the Federal Republic of Nigeria to operate as a private University and, as such, does not receive any government grants. As a senior College, the first set of Bachelor of Arts degrees in Theology were awarded under its own name in 1966. ACWA made history in 1975 by becoming the premier institution to sign and operate an affiliation agreement with Andrews University, Berrien Springs Michigan, USA. This relationship enabled it to train students and award Bachelors degrees from Andrews University, primarily in Biology, Business Administration, Theology, and Religion with minors in Biblical Languages, Biology, Business Administration, History, Religion and Secretarial Studies. Had never thought of the others besides the one I knew. Nice.